In bowl, combine lamb, shallot, lemon juice, olive oil, salt and pepper; cover and refrigerate. 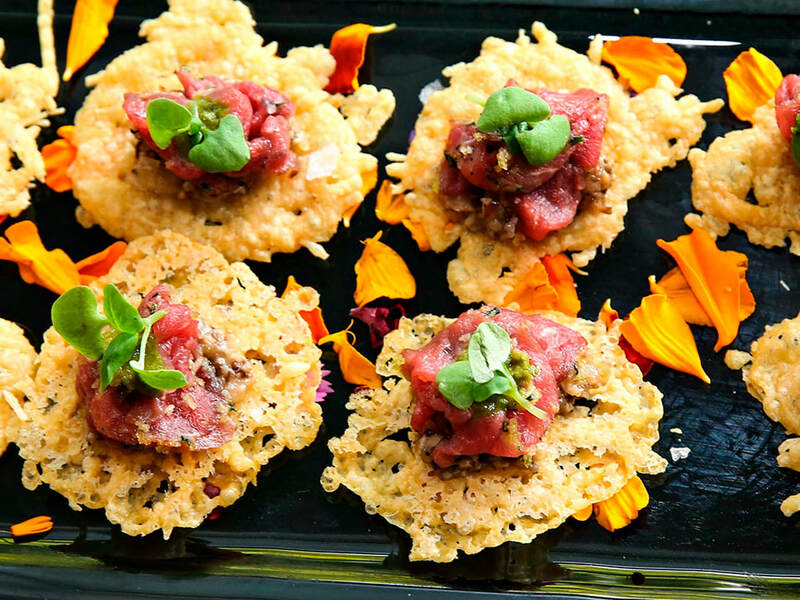 To serve, smear Parmesan Crisps with Mushroom Duxelle, top with spoonful of lamb tartare and a drizzle of Mint Chimichurri. Heat oven to 325 degrees. Mix together grated cheese and pepper. Line a cookie sheet with either parchment paper or a nonstick silicone baking pad. Using a tablespoon measurement, drop even mounds of Parmesan onto baking sheet. Using fingers, pat each mound into a thin circle about 3 inches across in size. Make sure no circles are touching. Or, if you want perfectly round crisps, set a biscuit cutter down on baking sheet and sprinkle a thin layer of cheese inside round mold. Repeat until all cheese is gone. Bake 5 minutes, or until golden and crisp. When crisps are still warm, fold them around handle of a wooden spoon to give them some shape, or just leave crisps as flat rounds. These are best when eaten soon after they’re made. If kept as leftovers, they tend to get less crispy and chewier. In a large skillet over medium heat, melt butter. Add shallot and garlic; cook, stirring, until softened, about 3 minutes. Add mushrooms and 1/4 teaspoon salt; cook, stirring, until mushrooms have softened and released their liquid, about 7 minutes. Raise heat to medium-high; cook until liquid has evaporated, about 3 minutes more. Stir in parsley, 1/2 teaspoon salt, and pepper. Let cool completely. In bowl of food processor, place garlic and pulse several times until chopped. Add mint and parsley leaves and pulse until finely chopped. (Alternatively chop everything finely by hand.) Remove to a medium bowl. Add vinegar, salt, and red pepper flakes to mint parsley mixture and stir until salt has dissolved. Stir in olive oil.